Ryanair has told passengers booked on some of its Belfast to London services that their flights have been cancelled. The airline will reduce its service to Stansted to two flights a week from June 2. It follows an announcement from the airline in March that it was reducing the frequency of the flights for its winter schedule. In emails to affected customers, the airline said the reduction was the result of an "operational review". When Ryanair announced it was cutting back flights for its winter schedule it did not give an exact date for when this would come into effect. The airline's timetable now lists two flights a week from Belfast International to London Stansted from June 2. Ryanair currently operates three return flights a day between Belfast and Stansted, with an extra flight on Sundays. The BBC has asked Ryanair for a statement. Passenger Gareth Stitt told the BBC the cancellations were "appalling, absolutely shocking". He was booked on a flight from Belfast to Stansted on June 8 and a return flight the following day. 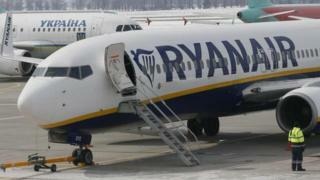 Mr Stitt said he was annoyed that Ryanair had cancelled the flights despite having taken the bookings in recent weeks. Adam Seymour had a return trip from London Stansted to Belfast cancelled. He said the cost of the flight had been paid back to him but that he is frustrated that no extra payment has been made, given that he had to book alternative flights. The Consumer Council said it was aware of the issue and offered advice to passengers who have had their flights cancelled.